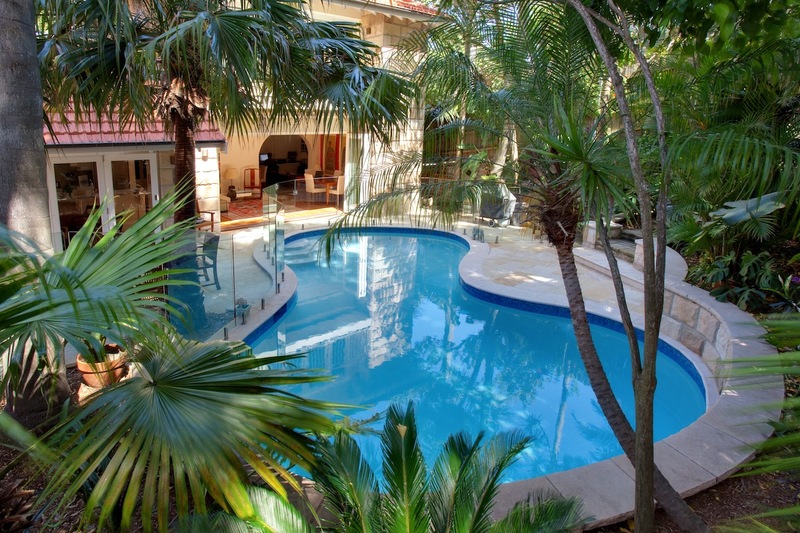 This suburban tropical oasis shows off Sunset’s approach to upgrading an outdated Sydney swimming pool and its neglected surroundings. The discerning North Shore home owner’s vision was to enhance his garden’s natural ambiance by creating an eco friendly leisure environment to complement his prestigious new home extension. 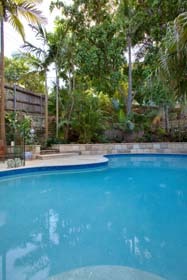 Requiring environmentally considerate restoration both the pool and landscaping demanded extensive renovation before the family could fully enjoy their new surroundings. The property’s pre-existing pool structure was modified, removing the dated pebble beach and reforming the shells freeform perimeter. The interior painted render and tiling were ecologically removed before the shell was core drilled for its replacement Sunset Standard hydraulics and updated interior LED lighting. 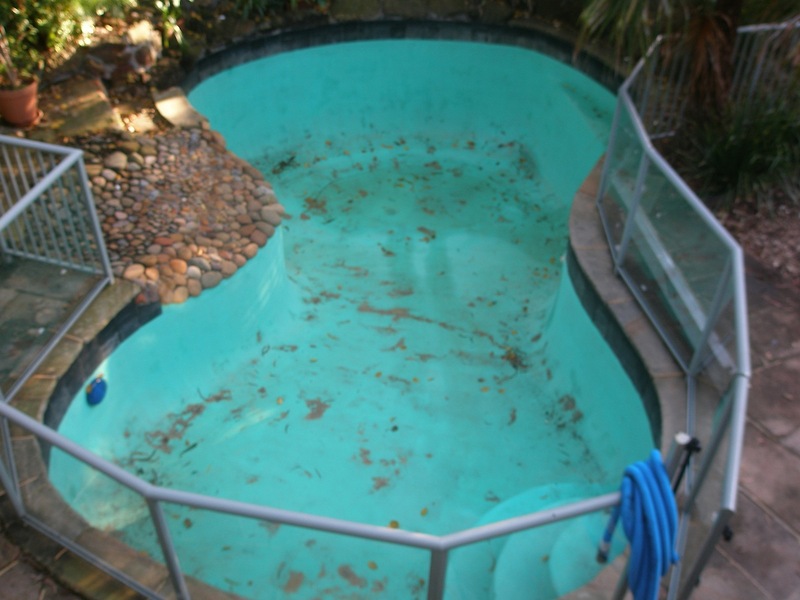 An aging swimming pool will likely detract from any improvements you undertake to either your home or garden. Call 1300 000 412 today to discover today how Sunset can restore and enhance your contemporary leisure assets. Alternatively, complete the online enquiry. Epitomising Sunset Pool Renovations approach, this extensive transformation and restoration of an established concrete pool and its surrounds earned Sunset Pool Renovations a SPASA silver medal. 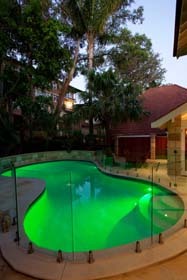 The renewed pool’s high quality ‘Gemtex’ interior features durable, low maintenance glass crystals that catch the light. Together with the ‘Bisazza’ glass mosaic waterline tiles they complete this prestige new Sunset finish. Sunset Pools attention to detail extended to fully lining the skimmer interior to obscure the standard ABS plastic housing and match the pool’s waterline finish. The superb hand picked Himalayan sandstone pool paving was matched with the local Gosford sandstone used to construct new retaining walls. 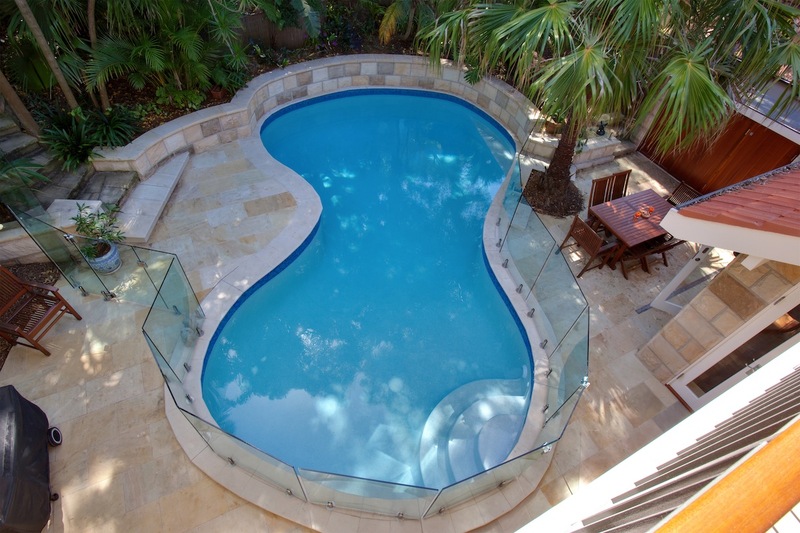 Frameless free flowing safety fencing that blended into the natural curves and contours of the pool and its landscaped setting was key to maintaining the illusionary natural appearance of this artificially created environment. The glass fencing reflects adjacent shrubbery as well as presenting an unfettered view of the imposing pool and gardens from every vantage point. 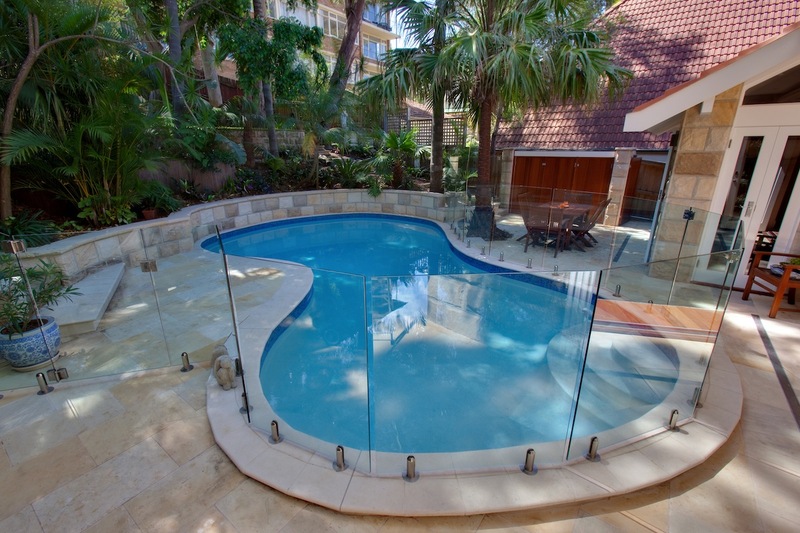 Pool access is accommodated from the house and gardens through no less than 3 unobtrusive glass gates. Each is fitted with custom designed and engineered high chrome polished stainless steel locks, spigots and hinges to accommodate the fence’s bespoke curves. 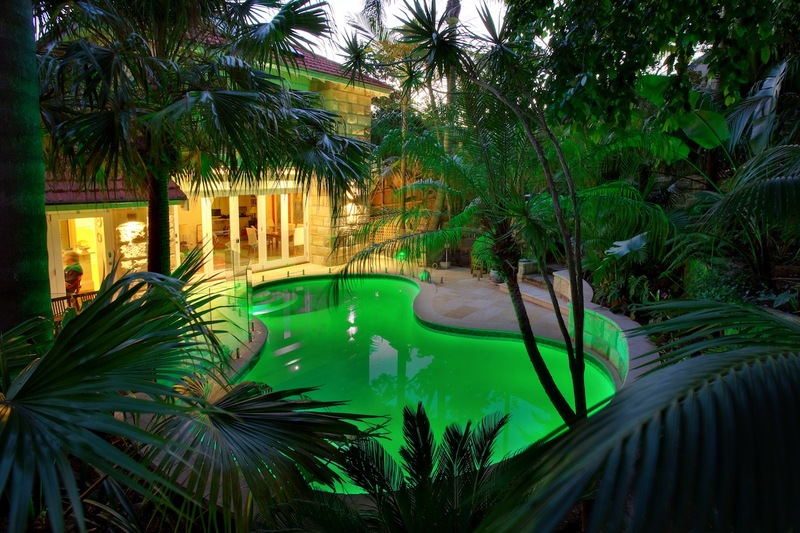 After dark this tranquil oasis take on an entirely new personality, left on auto the pools striking multi coloured LED lighting helps create a party atmosphere. Alternatively, a colour choice can be pre-set to suit your particular evening mood. Sunset understand that awards are not given for ‘creative cover-ups’. Proper preparation, repairing faults, often deep within the concrete shell, and restoring surfaces are the fundamentals of every Sunset Pool Renovation’s finish. Outside this pools obvious visual appeal are a number of less evident new additions. Sunset Pool Renovations’ innovative incorporation of the most advanced and efficient water filtration, heating, safety accessories and quality lighting technology are largely concealed. Sunset’s accomplished pool designers and builders have received many accolades for some of the country’s most outstanding technical milestones in pool renovation. As a result, Sunset Pool Renovations win numerous medals for their ability to creatively integrate the best advances in efficient water filtration, heating, safety accessories and lighting technology in addition to simply looking good. 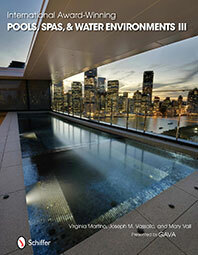 Top quality renovation techniques reflect the modern pool owners more ecological aspirations and are underpinned by what has become known as the ‘Sunset Standard’. A combination of quality attributes that equip Sydney’s most discerning homeowners with an environmentally superior and lasting asset. This free-form North Shore pool has had Sunset’s 50mm hydraulic pressure pipe fitted throughout to make certain that it always operates at peak performance, minimising maintenance, reducing operating overheads and optimising overall efficiency. This example’s upgraded environmentally friendly ‘Waterco’ filtration and water management systems will be far more efficient and will require far less resources to operate for many more years to come. Sunset Pool Renovations provide specialised consulting on refurbishment services and pool insurance restorations to commercial and government clients, in addition to quality domestic projects. Sunset’s name is synonymous with accurate estimating, sound administration, safe and environmentally responsible work practices and having all the required licences and insurance. If your existing swimming pool falls short of today’s efficiency ratings, discover how Sunset improve and update your aging leisure asset, to better serve you and your environment. 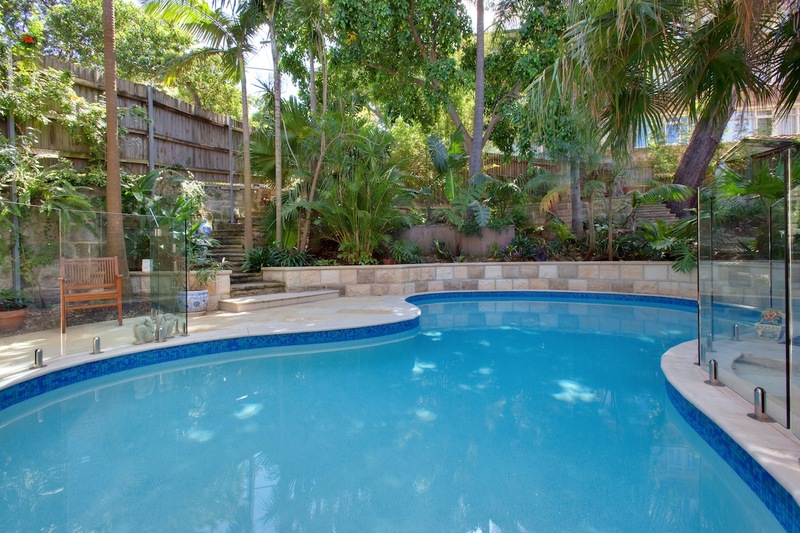 Call Sunset Pool Renovations on 1300 000 412 or complete the enquiry form right now.